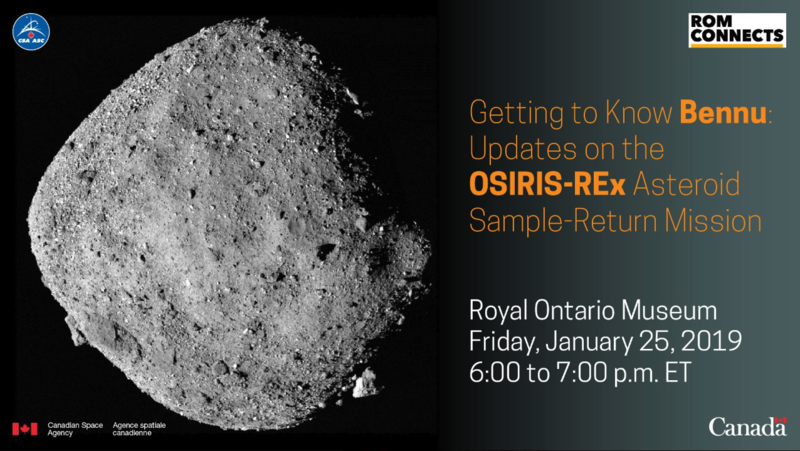 TORONTO, Jan. 22, 2019 –Lassonde School of Engineering Professor and Director of York’s Centre for Research in Earth and Space Science Michael Daly will join a panel of Canadian scientists and engineers from NASA’s OSIRIS-REx to update the public on the first-ever sampling mission by NASA that explores the near-Earth asteroid, Bennu. The mission, which plans to bring a small sample back to Earth, aims to revolutionize our understanding of asteroids and the origins of the universe. Daly is the scientific lead for the Canadian instrument on the mission. Daly will speak about how York University’s research is contributing to this exploration and contribute to the discussion on how Canadian research and expertise is involved. Canadian experts Tim Haltigin (Canadian Space Agency), Kate Howells (Planetary Society, Government of Canada’s Space Advisory Board member) and Kim Tait (Royal Ontario Museum) will join Daly to discuss the latest OSIRIS-REx data transmitted to Earth following the spacecraft’s arrival at Bennu in December 2018.